An analysis of prospective studies in patients with hypertension found that night-time heart rate measured by ambulatory recordings was a better predictor of mortality than elevated heart rate in the clinic.4 The analysis included 7602 hypertensive patients with ambulatory blood pressure (BP) and heart rate recordings from 6 prospective studies in Italy, Japan and Australia. They defined tachycardia as an office heart rate >85 beats/minute or a night-time heart rate >76 beats/minute (these represented the upper quintiles). 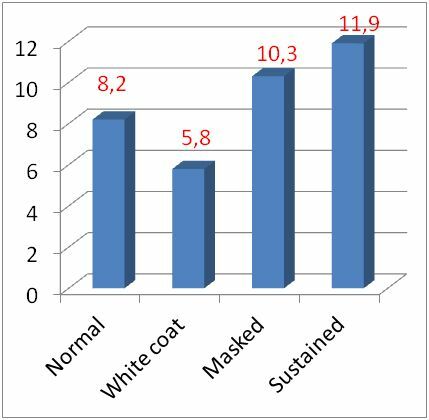 Patients with elevated heart rate in the clinic but normal night-time heart rate were considered to have white-coat tachycardia whereas those with normal clinic heart rate but increased night-time heart rate were classified as having masked tachycardia and those with elevated heart rate in both clinic and night-time recordings had sustained tachycardia. White-coat tachycardia was not a significant predictor of increased major adverse cardiovascular events (MACEs) or all-cause mortality, whereas increased risk of MACE was seen with both masked tachycardia [hazard ratio (HR), 95% confidence interval (CI); 1.40, 1.11–1.77] and sustained tachycardia (1.86, 1.44–2.40) (Figure 1). In adjusted models, masked tachycardia was the only significant heart rate predictor of excess mortality with a HR of 1.62 (1.14–2.29) or in multivariable parsimonious Cox models 1.68 (1.18–2.41). These findings would support making additional measurements of ambulatory or out of office heart rate to define the risk of tachycardia more clearly. Drugs that increase heart rate may also have adverse effects on cardiovascular morbidity and mortality. Sibutramine was used as a weight-reducing agent but its action was partly through increased sympathetic activity associated with an increase in plasma noradrenaline levels and increases in heart rate and BP.5 In the Sibutramine Cardiovascular Outcomes (SCOUT) trial, when following the 6-week, single-blind, lead-in period with sibutramine and participation in a weight-management program, the overweight or obese subjects randomized to sibutramine treatment had a higher heart rate ranging from 2.2 to 3.7 beats/min compared with the placebo group over the next 5 years.6 The increase in heart rate with sibutramine was associated with an attenuated fall in BP compared with the placebo-treated group and with sibutramine there were significant increases in the rates of nonfatal myocardial infarction and nonfatal stroke, but not cardiovascular or all-cause mortality.6 Following the SCOUT trial, sibutramine was withdrawn from the market. More recently, increases in heart rate have been seen with the longer acting glucagon-like peptide-1 receptor agonists (GLP‑1RAs), such as liraglutide, used in the management of type two diabetes mellitus (T2DM) and obesity.7 Overall, the GLP‑1RAs are well tolerated with little risk of hypoglycaemia but some increase in gastrointestinal adverse events.8 In the Liraglutide Effect and Action in Diabetes: Evaluation of cardiovascular outcome Results (LEADER) trial in patients with T2DM, treatment with liraglutide significantly reduced the primary composite outcome of death from cardiovascular causes and nonfatal myocardial infarction or stroke by 22%.9 The mean differences between the liraglutide group and the placebo group throughout the trial were a small reduction in HbA1c of 0.40%, reduction of body weight of 2.3 kg, reduction in systolic BP of 1.2 mmHg, reduction in diastolic BP of 0.6 mmHg but an increase in heart rate of 3.0 beats/minute. Whether the increase in heart rate with GLP‑1RAs represents a harmful effect is not known but if so, it was overcome by the beneficial effects with liraglutide in the LEADER trial and more recently with semaglutide in the Trial to Evaluate Cardiovascular and Other Long-term Outcomes with Semaglutide in Subjects with Type 2 Diabetes (SUSTAIN 6).18 However, treatment with the short acting GLP-1RA lixisenatide in patients with T2DM and a recent acute coronary syndrome had more modest effects on HbA1c, body weight, systolic BP and heart rate in the Evaluation of Lixisenatide in Acute Coronary Syndrome (ELIXA) trial and there was no significant benefit on cardiovascular outcomes.19 The increase in heart rate with liraglutide and other longer acting GLP‑1RAs may be attenuated by the loss in weight which also results in beneficial effects on BP, lipids and body fat distribution. Each of these effects may vary in different individuals, so it would be important to look at the overall pattern of cardiovascular risk factors including heart rate and not assume that every patient is going to benefit from the treatment. Furthermore, GLP‑1RAs were predicted to have direct beneficial effects on the heart, but in the LEADER and SUSTAIN 6 trials there were no significant reductions in hospitalizations for heart failure with the GLP‑1RA treatments.9,18 Likewise, in a study of patients recently hospitalized with established heart failure and reduced left ventricular ejection fraction, treatment with liraglutide had no significant benefit on primary or secondary outcomes.20 It is salutary to consider whether the effects of GLP‑1RAs on sympathovagal balance with a tendency to increase heart rate may offset some of their beneficial effects and it is important to monitor the changes in all cardiovascular risks including heart rate in individual patients to facilitate an overall assessment of the benefits and risks. Adapted from: Palatini P, et al. J Hypertens 2017;35:487-492.